It's been a while since the last status update, so it's time for the first post-act-1 report. The release of Act 1 saw a lot of things happening in a very short amount of time, which disrupted devlopment for a good few weeks as we all came to terms with what we'd wrought. 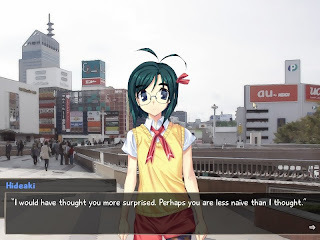 Every developer took different things from this period of time, but the most resounding was surprise at just how popular our Little VN That Could ended up being. However, this also brought with it a number of new things to learn such as forum moderation, dealing with a deluge of help offers ranging from translation to writing to art, and how to manage an exponentially growing IRC population. The experience though, in the end, has been a big morale boost. Now that we're getting back into the thick of work, the feedback we've recieved as been very helpful and at times surprisingly insightful. All paths have their first drafts complete, and writers are now refining their paths through the second draft. Feedback of the paths is given by all developers, especially the other writers and the path's respective artists, with each draft recieving a different level of rewriting and editing. Scenario is first and foremost what is scrutinised between drafts, with characterisation and overall writing style also being under strong consideration. As with the writing, art is also once again starting up after the Act 1 release. Sprites and CGs are being worked on, with good progress being made. Every side character has a sprite set now, with Meiko's set having recently been completed. - "When's the game coming out?" "When it's done" is the stock answer. However, please do not expect it this week or this month; it is still a long way off. Woah there, we haven't even finished the game yet. None of us have much idea of what we'll do after Katawa Shoujo is finished, and are paying little heed to the answer of that question until we finish this game first. Finally, as blog posts without pictures are boring, here's an in-game screenshot of Hideaki. I HAVE THIS REALLY GOOD IDEA FOR A CG!